The topic to be addressed in this text is the basic misconception on the question of the Balkan Albanian ethnogenesis [formation of an ethnic group] and national identity that was framed by extremely geo-politically coloured German-based “Illyrian” theory of the Albanian ethnic and cultural origin. This (quasi) theory, unfortunately, has very deep and negative regional political-security consequences. The implementation of the “Illyrian” theory of the Albanian ethnogenesis was accepted firstly by the Rilindja, (the Renaissance)–the Albanian nationalistic and chauvinistic political movement in 1878–1913 for the sake of creating the ethnically pure Greater Albania as a national state of all Balkan Albanians composed by self-interpreted all ethnographic and (quasi) historical “Albanian” territories at the expense of historical truth, justice as well as the Slavic and the Greek national interest. The so-called “Illyrian” theory of the ethnic origin of the Albanians (created by the German and the Austrian scholars) became purposely the most popular theory of the Albanian nation’s derivation among the majority of Albanian scholars, politicians, and intellectuals. The crucial and concluding point of this theory (in fact, it is actually a non-provable hypothesis) is that the Albanians are an authentic nation (ethnolinguistic group) of the Balkans, the oldest, aboriginal and autochthonous one in this part of Europe. As a result, the Albanians’ South Slavic neighbours (the Serbs-Montenegrins, and Macedonian Slavs) in contrast to the “indigenous” Albanians are just “newcomers” to the Balkans (who arrived at this peninsula “only” at the turn of the 7th century AD). Therefore, their ethnicity and nationality are much more recent than that of the Albanians. Subsequently, “historical rights” of the Balkan (quasi) autochthonous Albanian population on certain disputed Balkan territories (primarily between the Albanians and the South Slavs but also and between the Albanians and the Greeks) are stronger, more justifiable and historically more deeply rooted than the “historical rights” of the Serbs-Montenegrins or Macedonian Slavs. For that reason, it is expected that a “democratic” West will support the “justifiable” Albanian imperialistic territorial claims framed by the nationalistic idea of a united Greater Albania. Nevertheless, shortly, according to the theory of the Illyrian-Albanian (quasi) ethnolinguistic continuity, the Albanians are descendants of the ancient Balkan population – the Illyrians. The national name of the Albanians has to come from the name of one Illyrian tribe – the Albanoi. Furthermore, the tribal name, Albanoi, was the designation applied to the entire number of the Illyrian tribes around the Ionian Sea. However, the proponents of the Illyrian theory of the Albanian ethnographic origin built their scientifically unproved hypothesis mostly on the pure speculation that the modern Albanian language is directly descended from the ancient Illyrian one as well as that both of them belong to the same Indo-European language-group. Nevertheless, this claim is extremely disputed by the contemporary linguistic science. The fact is that the Albanian language as a spoken language of the inhabitants of present-day Albania was not mentioned in any historical source until 1285 when it is for the first time recorded under this name in the manuscripts from Dubrovnik in which the language was referred to as lingua albanesesca. The name for the land – Albanon (the territory on which the Albanian language speakers live) is derived from the name of the language. This term for Albania, according to the supporters of this theory, appears in several 13th-century Latin dictionaries, as well as in some of the Byzantine historical sources. The medieval sources referred to the region between Mache river on the north and Schumbe river on the south (both in present-day Albania) as Arbanon (or Arber) but without any connection with the Albanian ethnic name. The Serbs who were living there before the Albanians occupied this territory coming from Sicily in the year of 1043 called this region as Raban. According to the 2nd century Greek geographer Ptolemy, this territory was settled by the Albanoi tribe which was of the Illyrian origin. However, the name of the Balkan Albania and subsequently of the ethnic Albanians is not derived from Albanoi or Arbanon but rather from the town-name of Albanopolis or Albanum (White Town or Belgrade). “…if the Illyrians were the ancestors of the Albanians, then the Albanians, as original inhabitants, have some historical right to that region and possibly rights to other regions which had been settled by Illyrians. And their Illyrian ancestry has been very important in Albanian nation-building myths”[Fine J., The Early Medieval Balkans, Ann Arbor, 1994, 10]. The pivotal aspect (from a historical-political point of view) of the Illyrian (quasi) theory is the claim that the Illyrian-Albanian tribes withdrew from the vast areas of the Balkans settling in the Balkan coastal towns and in the mountains of present-day Albania, Epirus, Macedonia and Montenegro during the alleged Slavic invasion and occupation of the Balkans in the 6th and 7th centuries. However, according to this (quasi) theory, Kosovo-Metochia was the only fertile lowlands in the entire Balkan Peninsula, which were somehow not abandoned by the Romanized Illyrians-Albanians. As a result, the Albanians of the (quasi) Illyrian ethnic origin were and are considered as an autochthonous population of Kosovo-Metochia (in fact, Ancient Serbia) while the Slavonic Serbs-Montenegrins were looked upon as newcomers and occupiers in the region of Kosovo-Metochia. Shortly, the Illyrian-Albanian (quasi) historical and ethnic rights to Kosovo-Metochia – the land claimed by both the Albanians and their Serb-Montenegrin neighbors – had to be some 15 centuries older than the Slavonic Serbian-Montenegrin historical and ethnic claims to the same territories, according to the (quasi) theory of the Illyrian-Albanian ethnogenesis. This (quasi) theory emphasizes that in present-day North Albania an extensive settlement of old inhabitants emerged after the occupation of the Balkans by the more powerful South Slavonic tribes. There is particular emphasis on this part of the Illyrian (quasi) theory during the Balkan Wars of 1912–1913 as a way of refuting Serbia’s claims on the territory of the North Albania – a territory populated by the Serbs before 1043 when the Albanians became a Balkan people. Furthermore, it is claimed that the Illyrian-Albanian population from the lowland of Kosovo-Metochia began to come under the Slavonic political-cultural influence, while the Illyrian-Albanian mountainous tribes from the Albanian highlands, who had fewer contacts with the Slavs, succeeded in maintaining their social system and cultural inheritance without alteration. The defenders of this (quasi) theory claim that the Byzantine province of Theme Dyrrhachium (which was established around 809 and covered the entire present-day Albania’s territory, part of the North Epirus, the West Macedonia and the main part of the Montenegrin littoral with the area of Scodralake) was inhabited by the Albanians who “caused the region to develop a special (Albanian) character”. Charles I of Naples (1227–1285) established his own feudal domain under the name of the Regnum Albanai, which is tendentiously considered in the Albanian historiography as the first Albanian national state, located on the territory of the Byzantine Theme Dyrrhachium. Its capital became the city of Dyrrhachium (Durazo in the Italian, Durës in the Albanian or Drač in the Serbian). 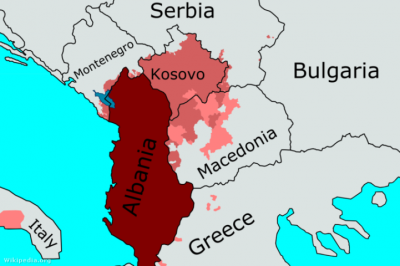 In essence, an official Albanian (quasi)theory of the Albanian ethnogenesis is heavily politicized and directed to the creation of a Greater Albania which will include among other “Albanian” lands and South Serbia’s province of Kosovo-Metochia – a cradle of the Serbian nation called by the Serbs as Ancient Serbia. Prof. Sotirovic is a frequent contributor to Global Research.